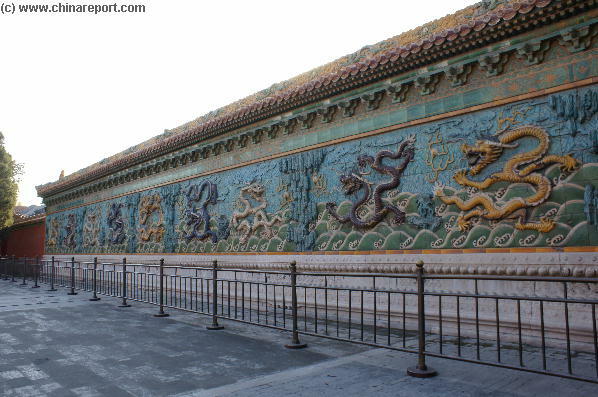 The Nine Dragon Screen, or Dragon Wall stands to the south of and facing the Gate of the Imperial Supremacy (Zenith) (HuangJi Men), the outermost gate of the Palace of Tranquil Longevity (Ningshou Quan Gong). Its function was to provide privacy by blocking the view through the Gate of Imperial Supremacy into the Palace of Tranquil Longevity. Such walls also found an important reason for existence in the rules of ancient Chinese geomancy (Feng Shui) as they deny access to evil spirits, which according to traditional Chinese beliefs must travel in straight lines and cannot turn corners. Thus, if a wall is placed in front of a gate or main entrance to a home, evil spirits are blocked from entering within. The screen is covered by a double roof in wudian (thatched hall) style covered with yellow glazed tile. The roof has five ridges, each having a dragon, and the main ridge also counts five dragons. Overview of courtyard outside of the Imperial Zenith Gate, with the 9 Dragon Screen on the left, the Imperial Zenith Gate on the right out of view and yet another well decorated gate, the Gate of the Bestowal of Congratulations, in the distance giving access to the wider spaces of the eastern inner court. (Photo: November 2007). The "Nine Dragon Screens" (Jiu Long Bi) stands in one of the remoter and more difficult to reach area's of the Palace Museum. It is situated well away from the most visited route, along the central axis, and is hidden behind a highly decorative triple gate, the Gate of the Bestowal of Congratulations (Xi Qing Men). To find the "Nine Dragon Screen" easily, one has to get at least a bit aquainted with the lay-out of the Palace Museum. And even then, one inside the Main Gates of the Palace, it is a considerable but very worthwhile walk to get there. To find the Nine Dragon Screen, one can enter either through the Northern Gate of Divine Military Might (Shenwu Men) or the Southern Main Gate of the Meridian (Wu Men). Although the distance to the north gate is probably shorter, the southern route is the least complicated and will therefor be described first. Due to their legendary nature and the fact that there are only very few original "Nine Dragon Screens" to be seen in China, the screen found outside the Imperial Zenith Gate remains one of the most popular attractions to be found within the Palace Museum. There are but a three remaining "Nine Dragon Screens" in China. 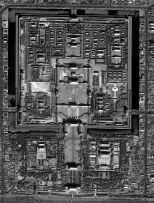 The Screen in the Forbidden City of Beijing is the youngest of these three. 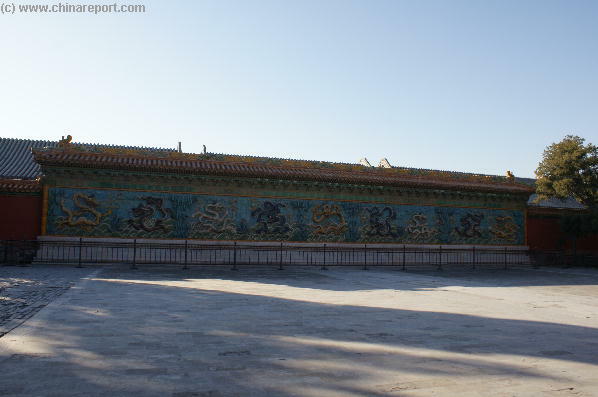 The Nine Dragon Wall 九龙壁 (Jiǔ Lóng Bì) is a relatively recent addition to the Forbidden City. The wall was built in 1771 as a part of a large renovation of the northeastern section of the palace to create a retirement villa for Emperor Qianlong (1735 AD - 1796AD). This retirement Palace was completed in the year 1773. In this sense it can be regarded as part of the Palace of Tranquil Longevity and its southernmost structure. Although, no doubt, if the screen could speak it would tell us magnificent tales of what happened in the by gone days of the Great Qing Emperors, and the Empress-Dowager, unfortunately world literature and historic leave us no mention of any significant moments or events that passed here at the Nine Dragon Screen in front of the Imperial Zenith Gate. largest and most illustruous of all the Halls in the Palace. Having found the Hall of Supreme Harmony, walk around it to reach the two Halls hidden behind it, these are the smaller Hall of Balancing Harmony (Zhonghedian) and behind that the large Hall of Preserving Harmony (Baohe Dian). You are now near your destination. From the platform here one can already get a hint of what lies to the north-east, however these Three Halls are the Main and Central Halls of the outer court (Wai Chou) and the "Nine Dragon Screen" is found within the Inner Court (Nei Ting). Close view of the triple gate of the bestowing of congratulations, which is situated in the eastern regions of the Inner Court, beyond the Archery Pavilion. red wall on the east flank of the Hall of Preserving Harmony to the reach the Central access Square of the Inner Court of the Palace. The entrance square of the Inner Court of the Palace is a huge space, with a multitude of directions to choose from. 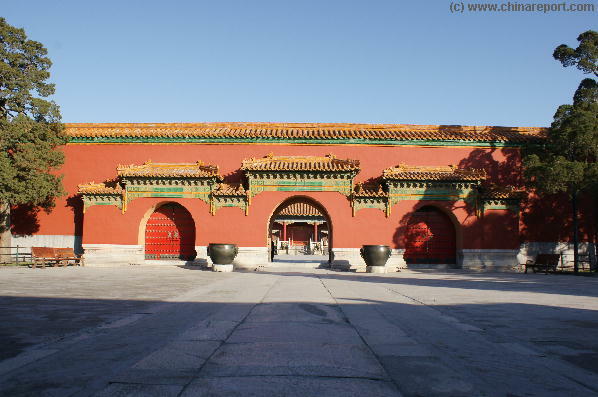 There are large gates, small gates, well decorated gates of variety and then the huge Gate of Heavenly Purity (Qian Qing Men) which leads to the Three Central Halls of the Inner Court. Enjoy this spectacular sight, however do not be distracted or discouraged by the number of gates in view. Overview shot of the paved space east of the Gate of Prospect and Good Fortune. To the North a single gate leads to the Palace of Bringing-Forth of Blessings (Yu Ching Gong), whereas to the East another such gate gives access to the outermost and southern court of the Clock & Watches Museum in the Chapel of Serving the Ancestors (Feng Hsien Tien). The Nine Dragon Screen is found nearby just to the south and beyond the Archery Pavilion. just passed through. This is the archery pavilion. Overview shot of the Nine Dragon Screen outside of the Palace of Tranquil Longevity in the easternmost reaches of the Inner Court. inside the Chapel of Serving the Ancestors (Feng Xian Dian). These are all worthy sites to explore however, you need not go in either direction. To find the Gate of Bestowal of Congratulations (Xi Qing Men) and beyond it the Nine Dragon Screen, simply leave the Gate of Prospect and Good Fortune behind you, to walk south towards the Archery Pavilion. After but a few steps you will find yet a larger paved space that opens up towards the East. The triple gate visible in the distance is your destination. This is the Gate of the Bestowal of Congratulations behind which stands the Nine Dragon Screen and across from it the outermost Gate of the Palace of Peaceful Longevity. 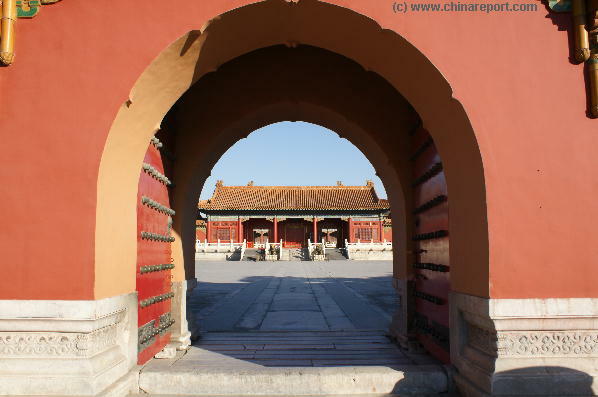 The alternative northern route takes one in the southern direction through the northern Gate of Divine Military Might (Shenwu Men) and through the Chastise Obiedence Gate (Chun Cheng Men) to descend into the Imperial Garden (Yuhuan Yuan) of the Palace Museum. The outhermost court of the Palace of Tranquil Longevity as seen from the Gate of the Bestowal of Congratulations. In the distance along the south wall the Nine Dragon Screen. largest, nor the oldest of the three remaining dragons screens, within the Palace Museum the Dragon Wall is probably the most bedazling of all the ceramic screen wall deorations found within. Being very well preserved, extraordinary in its kind and unique within the Palace it is a must see sight of the Forbidden City today. Although one has to makes ones way all the way to the easternmost parts of the Inner Court, the rewards of long walk are considerable. 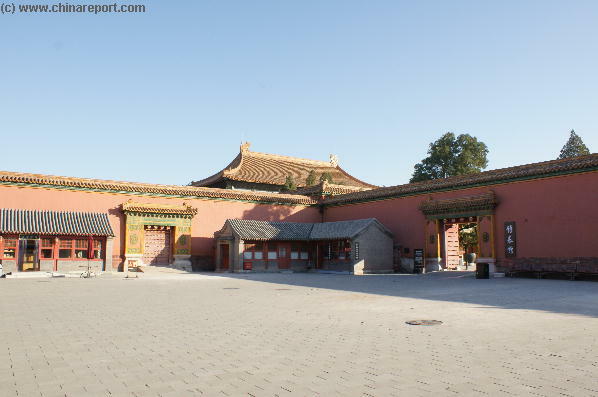 The sights along the way are never boring, the Dragon Screen is impressive and a visit to the Palace of Tranquil Longevity (Ning Shou Gong) afterwards will most likely be an unforgettable experience as this is truly the finest Palace within the Forbidden City. 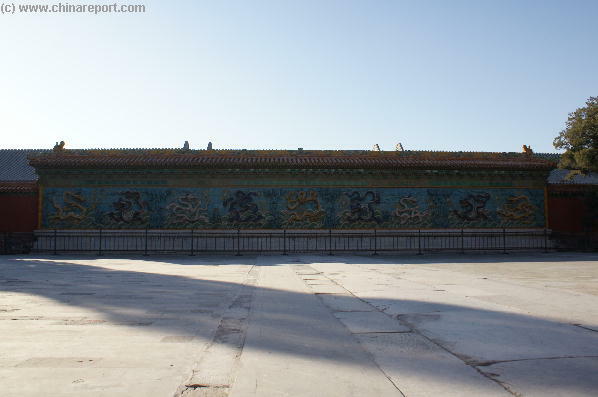 Full view of the Dragon Wall or Nine Dragon Screen and the courtyard across from the Gate of the Imperial Zenith (Huang Ji Men) of the Palace of Tranquil Longevity in the easternmost reaches of the Inner Court. Full view of the Gate of the Imperial Zenith (Supremacy) (Huang Ji Men) of the Palace of Tranquil Longevity, across from the Nine Dragon Screen in the eastern Inner Court. (number) accorded to the head of the imperial household making him a "father of the nation". In traditional Chinese myth, the dragon is a water animal. Unlike the western dragons it is not fierce and evil, but instead majestic and benevolent. It helps the people with its ability to make rain or calm waters. So, when a drought occurs the people call upon the dragon. Similarly, when a river floods, a dragon is called upon to dispel the waters. Therefor except for being the symbol of power, the dragon is also symbolic of luck and of anything to do with water. In some cases the dragon is also held to be symbolic of longevity, although in this case the turtle (tortoise) is the most usual choice. In the daoist mystical Chinese perception of the universe, the dragon also represented yang, the principle of heaven, activity and the maleness side in the yin-yang balanced view of traditional Chinese cosmology. Therefor, since ancient times the dragon had been adopted as the emblem of the imperial families. Being popular in Chinese myth, often identified with the Chinese Spirit itself, and a symbol of unusual power or strength the dragon is often depicted in Chinese tradition, including in common paper paintings, on screens to decorate rooms, or in this case to block off a major entrance from outside view and the pervasion of unwanted bad spirits. One Dragon can symbolize China as Nation, as was the case during the Ming and the Qing Dynasties, or it can purvey a message of personal strength and self-confidence. Multiple dragons depicted mean even more luck, power and benevolence. In the case of the Nine Dragon Screen there are 9 Dragons, which is number symbolic of the Emperor and therefor reserved for his use only. Therefor, a Nine Dragon Screen can only be an Imperial Screen and nothing else. In traditional Chinese culture, there is a close association between dragons and the number nine: a dragon has nine attributes, 117 scales -- 81 (9x9) yang and 36 (9x4) yin -- nine forms, and nine offspring. In the depiction, nine dragons are playing with pearls while swimming (or frolicking if one chose to be more poetic) in a sea of waves with a sky of lighter color is depicted above. Six sets of rocks provide for dividers. View of the multi-colored ceramic Nine Dragon Screen from the Gate of the Imperial Zenith (Huang Ji Men). There are two white dragons, two blue dragons, two brown-red dragons and 3 yellow dragons all of which strike a slightly different pose. A view through the Imperial Zenith Gate (HuangJi Men) at the Gate of of Tranquil Longevity (Ning Shou Men) beyond. (Photo: November 2007). individual pairs of dragons. Altogether, if one pays closer attention, there two dragons of each color, except for the three yellow dragons that are there clearly to symbolize the Imperial Greatness. The third dragon from the left is a different color on its bottom. 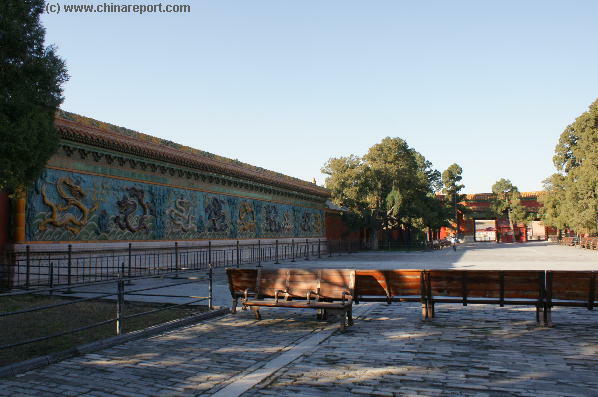 As is usually told by the tour guides when visiting the Dragon Wall at the Palace Museum, according to an old tale, the day before Emperor Qianlong's inspection, one tile (the bottom one of the third dragon) suddenly fell down. Since there was very little time left to make repairs, and everyone would be beheaded if one part was left unfinished or worse: would prove broken, as a last resort, a carpenter, one Ma De Chun, made a wooden one to look exactly like the original. Fortunately, when the emperor came to see his brilliant new Palace he did not discover the minor discrepancy in the Nine Dragon Screen and thus, the lives of all the craftsmen were saved. According to the story the reason why the bottom of the third dragon from the left is a different color is that after the many years, the paint has come off the wood, exposing its true color. The Qing Dynasty Era 9 Dragon Screen on the north shore of the North Lake (Beihai), one of 2 such screens in the former Imperial Capital of Beijing. paved space with many gates, find the east gate of Prospect and Good Fortune and follow the route as described above to the Gate of Bestowing Congratulations and the Nine Dragon Screen beyond. Buy your "Piao" Entry ticket at the "Gate of the Bestowal of Congratulations" before being allowed to enter into what turns out to be a surprisingly spacious courtyard. 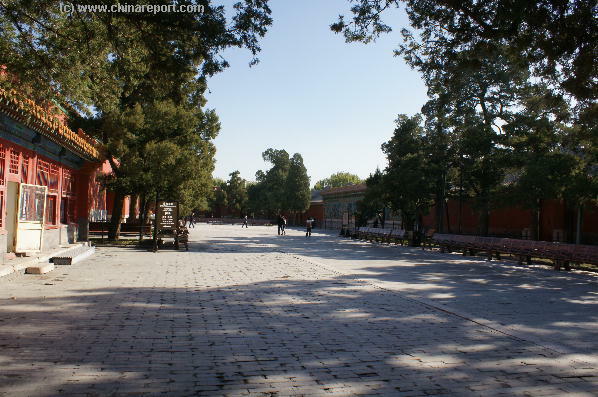 In fact, this court is much larger than the outermost realm of the Palace of Mental Cultivation (Yang Xin Dian) which was the most important residential Palace during the most of Qing Dynasty Era. 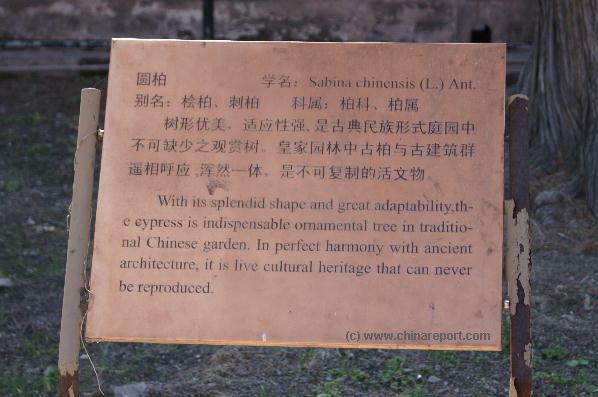 The courtyard has a central paved route leading east along cypress trees towards the Nine Dragon Screen. On the other side, in the north stand some smaller pavilions, which seem to have been for the use of servants and guards. 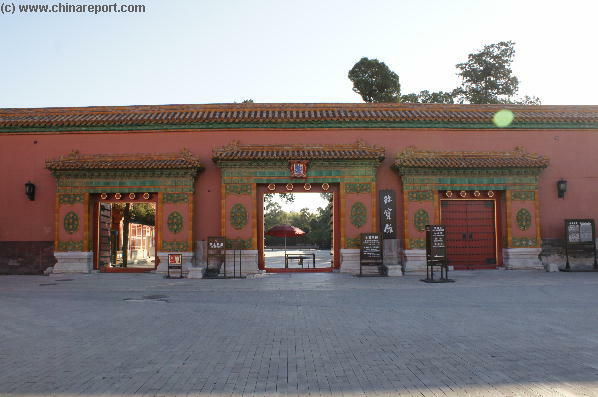 In the north, facing the Nine Dragon Screen stands the splendid Gate of the Imperial Zenith (HuangJi Men), also known as the Gate of Imperial Supremacy which leads northward into the Palace of Peaceful Old Age (Ningshou Quan Gong). Panoramic View of the Nine Dragon Screen in the Palace Museum. only remnant of an Imperial Palace of a Ming Prince, that once stood there even before Beijing became the Capital of the Ming Dynasty. The nine dragons on the screen are sculpted in high relief. It protrudes at points around around 20 cm (0.7 feet) from the screen surface, creating strong three-dimensional effect which makes the whole screen more lively. Buy an additional ticket to see the complete Palace of Peaceful Longevity.